So he’s back and ready to re-establish himself all over again. Of course, being Robert Plant re-establishing yourself doesn’t mean a total change of image or musical stance. He just draws on the many influences that have characterised his journey of the past 30 years and extracts from them as he sees fit. What’s so refreshing about ‘Fate Of Nations’ is that, for this occasion, Robert has delved into the very essence of his roots going as far back as Muddy Waters, Howlin’ Wolf and Robert Johnson, through Moby Grape, Quicksilver, The Incredible String Band, and Fairport Convention to the music of India and North Africa and, of course, the work of Led Zeppelin. And in taking these influences he has not allowed them to be diluted into a slick or soulless concoction but as he describes it, he has pumped them to inspire a set of new compositions that live and breathe yesterday, and by the same measure, push for the aspirations of tomorrow. ‘Fate Of Nations’ is therefore devoid of any grunge outings if you were looking. It’s also a step away from the rather staid standard rock formula that rendered some of the more mundane moments of ‘Manic Nirvana’ (‘She Said’, Big Love’) into the realms of mediocrity. By surrounding himself with new players and passions, Plant has pleased himself in taking his music where he wants it to go, and not where the consensus of opinion might expect it to go. For that reason alone, this album is vastly different from past solo outings. Much of it demands utmost attention and does not rest easy on the ears in one listening. It may not be immediately apparent, but given time and repeated playback, the end result is a rewarding experience that for me, again confirms this particular 44 year old’s status as the outstanding vocalist of this or any other era. The eclectic content of ‘Fate Of Nations’ perhaps also illustrates the difference of musical opinions that now divides Robert and Jimmy – and goes some way to explaining why a Led Zeppelin reunion could never work. 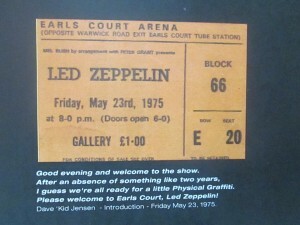 Let’s face it, If I Were A Carpenter’ would not have found itself easily on a Zep reunion album. 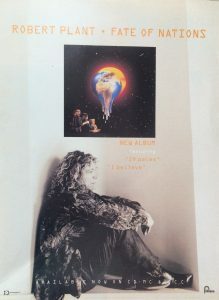 There is a totally different atmosphere prevailing on Robert’s album than that of the Coverdale Page set. Jimmy’s music is built on relentless riffing that captures a vast vacuum of sound. Robert has seemingly moved away from that stance, preferring to move around organically as he puts it, encompassing different styles and genres. 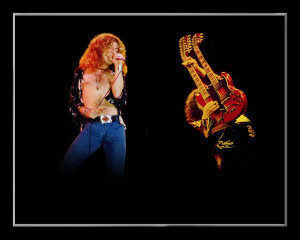 Not that he has lost his ability to adapt such Zep-like dynamics (witness ‘Calling To You’) when the desire takes him. For the most part though, the dynamics are alternately diversified and for me personally that’s not a problem. I can quite happily enjoy Jimmy and Robert’s respective new works based on their own differing merits and motives. So this isn’t music that can be pigeon-holed to the cover of Kerrang. This is Robert Plant in 1993, still offering up that vocal style (his singing throughout is quite exemplary) that continues to give him a reason for being … instead of a reason for having been. It all begins with ‘Calling To You’ which is simply the business. Beginning with some minor key strumming it then tacks into shape via Pete Thompson’s powerful (and yes perhaps Bonham-like) drumming. This really is a definite Zep throwback stomping along with some great dual guitar effects from, I think, Francis and Kevin. At the centre Robert turns in a majestic vocal, often undercutting the mix with additional bizarre phrases that add to the mystery of the lyric. All the old trademarks are intact (“Ohhhh Yeeaahhl”) and as effective as ever. The instrumental refrains have an Eastern quality about them and are further enhanced when one Nigel Kennedy enters to layer on a manic violin solo that recalls to mind the effects on The Beatles’ Tomorrow Never Knows’. Could this be Robert’s own personal retort to his former partner? Perhaps illustrating that he can still turn on his sort of dynamic style when required? All in all it’s an infectious and engrossing slab of archetypal Plant that proves that he can still commit himself to this vocal style better than anyone. It’s also one of his best solo tracks to emerge in a very long time. Elsewhere there are many differering styles to assess. ‘Down To The Sea’ is a quirky, repetitive Cure-like ramble, led by a subtle injection of Eastern table drums. The descriptive nature of the repeated lyric (“When I get older settling down will you come down to the sea”) conjures up video storyboard images of deserted grey beaches and the retired Plant many years hence holding court in carnal Malibu style with a bevvy of beauties still in tow. Vaguely psychedelic and dreamy, this track has a very ambient feel and is a very enjoyable departure. ‘Come Into My Life’ can be viewed as a direct influence of his hanging out with the Fairports. So enter Richard Thompson to add some achingly beautiful guitar licks and Maire Brennan from Clannad to float around Robert’s turn of phrasing. The chorus is heavily scored by a rush of acoustic guitars from which I detected a slight ‘Over The Hills’ leaning. The middle guitar part from Richard is superbly atmospheric and amongst the most elegantly constructed solos I’ve heard in an age. Robert’s vocal (“Ohh when yer get there well you know”) is also superbly recorded, capturing the gentle folk essence of the track but also rising in temperature with the chorus as required without ever losing control. This as good as anything he’s done in the post Zep years. “Memory Song” (Spikes Ghost) lurches in on a loping churning riff that proceeds to dominate the tempo. Robert’s vocal is nondescript and slightly phrased. The drum beat has a touch of the ‘Levee Breaks’ about it and towards the end the piece becomes a vehicle for some typical Plant gymnastics (one of which is right out of the fade to ‘Four Sticks’). lyrically ”Are you lost without the group ”is a telling line to who this might apply to. The appearance of ’29 Palms’ changes the mood. Already familiar as the first single, within the confines of the album, it leaps out as being overtly commercial, with some very Knopfler-like guitar licks and a nice driving feel. All very likeable. ‘Colour Of A Shade’ takes over where ‘Liars Dance’ left off on the last album. Framed by a series of attractively overdubbed acoustic guitars, Robert applies a very folksy vocal that leads to an affectionate chorus. Shades of the Incredible String Band prevail throughout. File next to ‘Going To California’. Side 2 opens with ‘I Believe’. The intro has a distinctly ‘Tears For Fears’ sounding keyboard motif (producer Chris Hughes influence) before moving into a very pretty strident mid-tempo chorus-led excursion likely to be pulled as the next single. Lyrically it’s not too difficult to detect a very personal message in the lyric (“Say brother sister see your brother in the sky”), which is duly reflected in the emotional content of Robert’s singing. “Like the wind you are free so talk to me, talk to me”. I guess we all know how the latter line will be extended in a live setting. There’s a very Beatlish flavour to the guitar solo here and overall this is another successful deviation from the expected. Promised Land’ is more traditional fare, a bluesy strut with some prominent organ early on, before the familiar harmonica merges with some stinging guitar at times embellished by wah wah effects. His vocal here has a very retro feel which is almost ‘Physical Graffiti’ in texture. There’s an offbeat peculiarity about the whole track that draws you in on subsequent listening. Another departure heralds the arrival of Great Spirit’. Set against a muted wah wah guitar effect played slow and moody, Robert croons over a repeated background chorus (“Great spirit comes”). Soulful and tasteful with some impressive guitar soloing but not a riff in sight. The lyrics include a reference to the album title and it all mellows out into the distance via some echo vocal effects as the master heeds the lyrical call of a previous incarnation (“Sing and Celebration”). “The Greatest Gift opens with string induced grandeur. This is an epic love ballad, again more soulful than bluesy. It livens up for each power chorded chorus before returning to a very moody and mellow theme aided by some silky smooth guitar lines. The addition of a full string accompaniment adds to the epic nature of the piece. The whole thing has a widescreen effect and it strikes me that the song would make a great movie soundtrack theme. Plant’s impassioned vocal just soars. And then . . . Robert joins such illustrious company as Bobby Darin, The Four Tops, Johnny Cash, and The Band Of Joy in covering the Tim Hardin 60s classic ‘If I Were A Carpenter. It’s a superb performance beautifully sung with full respect for the original and underscored by a subtle snare injection and another lush string arrangement. It’s a song he was familiar with long before there was Led Anything around circa 1967 and though it’s hardly the usual formula, it proves to be a perfect vehicle for his voice. And who knows, it could be a huge smash if extracted as a single at the right time. And that is ‘Fate Of Nations’. An album that explores many different facets of Robert Plant’s compound of influences. It may take a few repeated listening but stick with it, because the end result will be immensely satisfying. Led Zeppelin’s greatest strength was always their sheer diversity, a point clearly not lost on their ex-singer 25 years after their original inception. 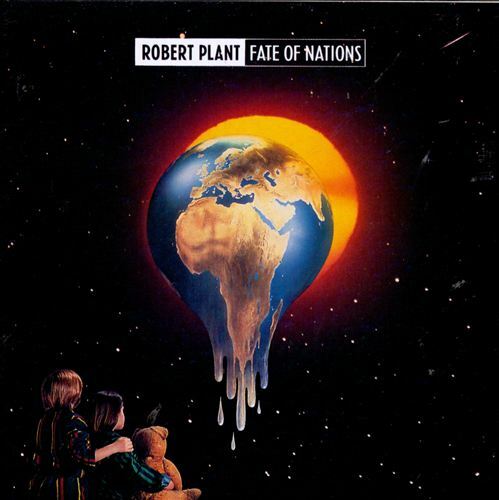 On ‘Fate Of Nations’ Robert Plant employs diversity as a function of union. Share it with him at your earliest opportunity. STOP PRESS Please note early tapes of the album did not carry the track Network News’ which I was unable to review due to the already overdue printing deadlines. Just received the second CD of ’29 Palms’ with the new acoustic ‘Whole Lotta Love’ – it again employs Rainer on steel guitar – a sparse bluesy workout very much in harmony with Willie Dixon’s original “You Need Love” which no doubt accounts for the subtitle employed on the sleeve. From a grand entrance in front of over 100,000 in Milan on May Day 1993, through to the less populated confines of the Kings Head, Fulham and across a variety of European halls and festival dates, Robert Plant’s first tour in three years has produced one of the most intensive and interesting work periods of his entire career. Stretching from the early Spring into late August he has appeared in front of well over a million people. In launching this new phase of his career, Robert has been firmly committed to taking the music to the people. 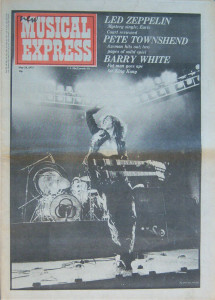 With little pretentions for the arena rock circuit which by his own admission his audience would be unlikely to extend to filling, Plant and his new line up embarked on a promotional trip that ensured a strong visibility by shrewdly taking a support slot with Lenny Kravitz and making up the bill on several major European festival dates, including a triumphant UK return at Glastonbury. Alongside the actual live appearances, there have also been the media plugs. These have encompassed a hefty round of promotional TV and radio interviews with the added spice of several acoustic sessions that have been responsible for some surprising performances. 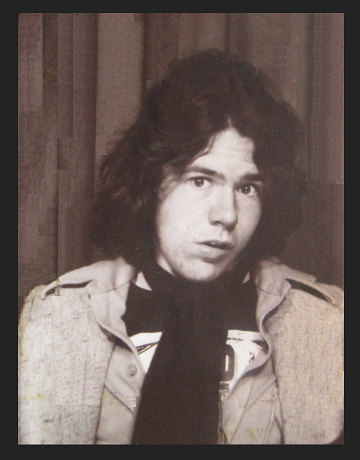 The ‘FateOf Nations’ media UK push also propelled the new line up on to the small screen with appearances on ‘Top Of The Pops’ and ‘Later With Jools Holland’ – the latter signalling Robert’s first ever live UK presentation in his own right since the Zep 1969 one off. Plant’s own musical leanings (hence the introduction of the East coast Moby Grape/Springfield influence). To the left of the lead singer has stood Francis Dunnery, a strident guitarist well versed in the Page songbook and a strong personality on stage (can’t say I was over enamoured with the green shorts mind!). His stay could also be limited as there are plans for him to tour in his own right in early ’94. On drums, Michael Lee has proved to be an excellent addition with a no frills attitude to attacking the kit (Calling To You) coupled with a subtlety in his approach when the occasion demands (witness the rimshot style on the new arrangement of Ship Of Fools). The actual set list employed seems to have caused quite a division amongst the faithful. After the No Led Anything approach pre-83, the contention of what to play seems to have come full circle. This time out there has been a renewed emphasis on performing Zep numbers – a total of 11 were aired along the tour against a ratio of 9 of his solo outings (plus two non originals). Of those nine Plant solo outings, none of the songs delved back further than the 1988 Now And Zen album. It’s almost ironic that many of the diehards I’ve spoken to said they would have preferred Robert to have reinvestigated earlier solo tracks such as Pledge Pin and Burning Down One Side at the expense of a Zep delivery or two. 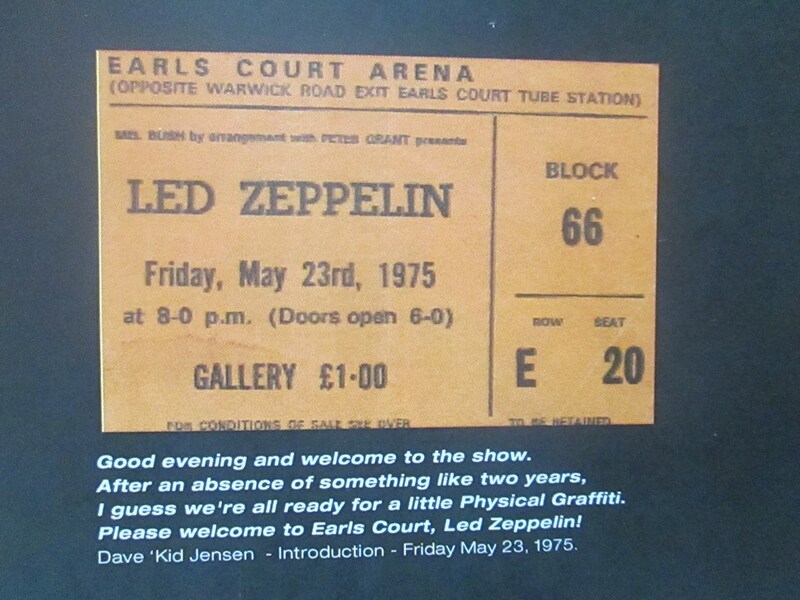 Of the Zep numbers re-employed Thank You and What Is And What Should Never Be received their first live airings in 20 years and seemed to be most welcome by all that heard them. The actual structure of the set was changed to match the differing time slots – a rigid 45 minute set was the norm for the supports to Lenny while the festival set was elongated to over an hour. 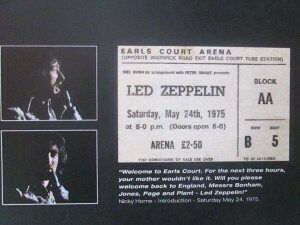 The UK meanwhile received something like the duration that the US leg enjoyed with plenty of encore surprises – the most striking of which was the verses of Dazed And Confused performed at the NEC. Three tracks were used as set openers with Tall Cool One eventually emerging as the key choice over Hurting Kind and Calling To You. Visually his persona seemed a throwback to the golden age with the hair back to Earls Court centre parted length. Time has not been too kind to his facial lines however and I also observed something of a receding hairline when the sweat dripped off the hair. But he looked fit enough -incorporating that new whirling dance style with perhaps a more paced physical approach that kept the peacock preening for later in the set. In amongst all the media saturation Robert has played off the usual Zep investigations with a combination of flippancy and perception. Sometimes appearing not to care too much about the past, while at other times keen to re-affirm their greatness and affectionately talk of John Bonham. The other media cat and mouse game surrounded the Coverdale Page project with Robert again mixing some guarded replies with a few unsubtle and unnecessary snipes. When it comes to such matters, he should really let the music do the talking. And it was the music that was the real focal point of this return to the people. And for me the most striking factor through it all, has been the quality of his vocals – with performances such as Thank You’ and ‘I Believe’ recalling the purity of those early teenage Atlantic recordings of nigh on a quarter of a century ago. In fact some 20 years after he first introduced us to the ethic on the ‘Houses Of The Holy’ album, Robert Plant is still singing to an ocean . . . and judging by the reaction to this European tour. . . the ocean hasn’t lost its way…..
An updated edition of Stephen Davis’ Led Zeppelin biography “Hammer of the Gods” was released earlier this week. The updated book is available to purchase on Amazon. Jimmy Page has been photographed by his daughter Scarlet Page to celebrate Led Zeppelin’s fiftieth anniversary. See a photo from the photoshoot here. Jimmy Page’s local council has provisionally approved his neighbour Robbie Williams’ plan for a basement, which Page has fought to stop happening for years. The final decision will be made in a meeting of the Royal Borough of Kensington and Chelsea Planning Applications Committee on the evening of May 29. Read our full history of the feud here. 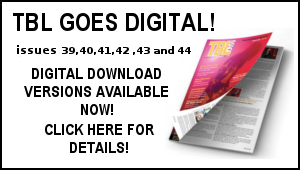 The documentary “Still On The Run: The Jeff Beck Story,” which features an interview with Jimmy Page, was released on DVD, Blu-ray, and digital download this week. You can find out more about the release here and read our transcript of Page’s comments in the film here. 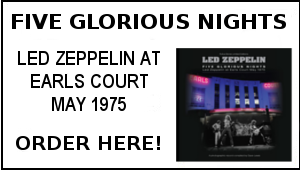 May 29 – The Royal Borough of Kensington and Chelsea Planning Applications Committee will decide whether to approve Robbie Williams’ basement extension, which Jimmy Page has fought for years. Turning the clock back 43 years.. The days in between the first two gigs had been pretty non stop. Tuesday at short notice I went to see Swan Song artists The Pretty Things support Status Quo in Ipswich with the Atlantic rep who called on the WH Smith record department I worked in. A truly great gig it was too. 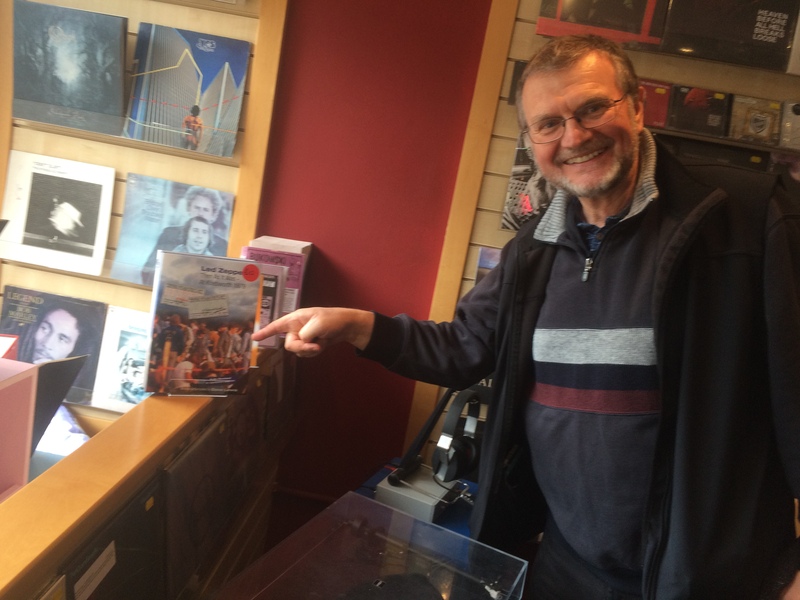 Next day he brought in to the shop 30 copies of the limited edition UK Trampled Underfoot single – yet another bonus!. Thursday was spent soaking up the music press with the arrival of the NME and Melody Maker front covers (those cover pics were just awesome!) – The excitement just didn’t stop. After the frantic pace of attending the two first gigs, Friday seemed a much more relaxed affair and I took much more in. The weather was good too and beforehand my then girlfriend Fiona and I drank a bottle of wine in Hyde Park. Then it was to SW8. The view this time was the opposite side to last week and we scrambled down a few tiers taking some empty seats. A full on if slightly distant but clear view on Jonesy’s side. 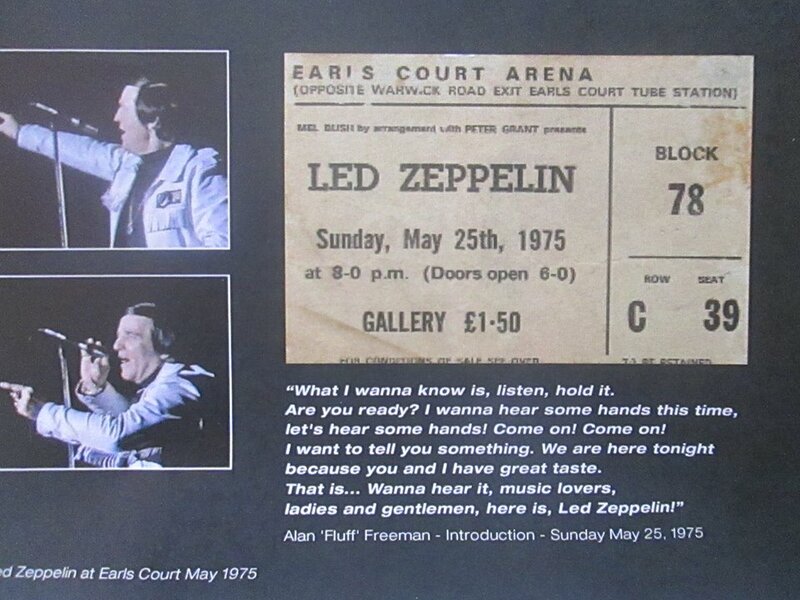 From the moment Plant gave out an excited Immigrant Song ”Aha ah” squeal as Bonzo and Jimmy did the usual warm up, well it was so evident they were up for it. Fashion note: For this night only Robert wore the cherry wrap around shirt he’d favoured on most of the ’75 American tour. 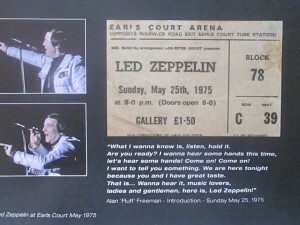 Images ingrained on my brain for the past 43 years: Watching Jimmy slither across the stage as they hit Sick Again, Plant seemingly lost in a trance right in front of us as Page did the solo in Over The Hills, dry ice seeping above us over the front rows in No Quarter (should have bottled it –imagine that on ebay! ), Jimmy holding the Gibson double neck aloft during the Song Remains intro, the stand up microphones being brought out for the four part harmony of Tangerine, being so close to them clustered together for the acoustic set (incidentally listen to the various soundboard bootlegs – just before Going To California Robert introduces the song saying ‘’This is a song about the would be hope for the ultimate…for the ultimate’’ – after which you can hear a distant yelled squeal just before somebody starts whistling – that’s my squeal folks), Trampled Underfoot and the revolving lighting creating a real sense of speed, the normally reserved Dec next to me going crazy in a manner I’ve not seen since, Page’s violin bow and going ”Ahhh’! as the lasers spiralled above us. The last few moments of Stairway as the mirrorball created that swirling spinning effect and thinking I must have died and gone to heaven! There sitting on a limo was Robert Plant – blue sparkled jacket (the same one he wore on the Midnight Special TV show interview appearance in March 1975), white scarf and draped in bracelets and rings looking for all the world like a Greek god. Being right in front of Robert at that moment was just incredible. An unforgettable image. After getting over the sheer shock of seeing him, I asked the rather dumb question when would they be playing in England again. ”There’s a lot of traveling to do first” was his reply. We walked across to the entrance where the aftershow party was taking place with Plant and his wife Maureen and Rusty from Showco . Robert sang a few lines from Kashmir as he scuttled through the entrance. We also saw Bonzo, Jonesy and Jimmy arrived along with Chris Squire from Yes, Bob Harris and Jeff Beck. There would be many dazzling episodes ahead, but perhaps nothing with the sheer uncomplicated joy and optimism of that week in May 1975 all of 43 years ago. Dave Lewis – May 23, 2018. 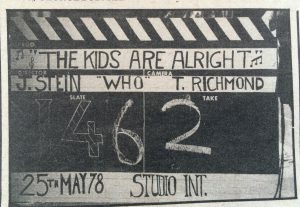 40 years ago this week on May 25 1978, I was lucky enough to attend a secret filming of The Who at Shepperton Studios. This was arranged to capture footage for their film the Kids Are Alright. 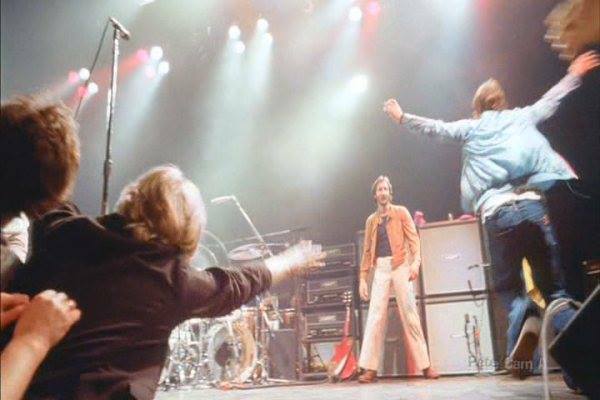 Little did I know back then that a rather excited spontaneous leap on to the stage by me at the close of their performance of Won’t Get Fooled Again would be captured for all time – and featured in the film – and subsequently on DVD and YouTube. 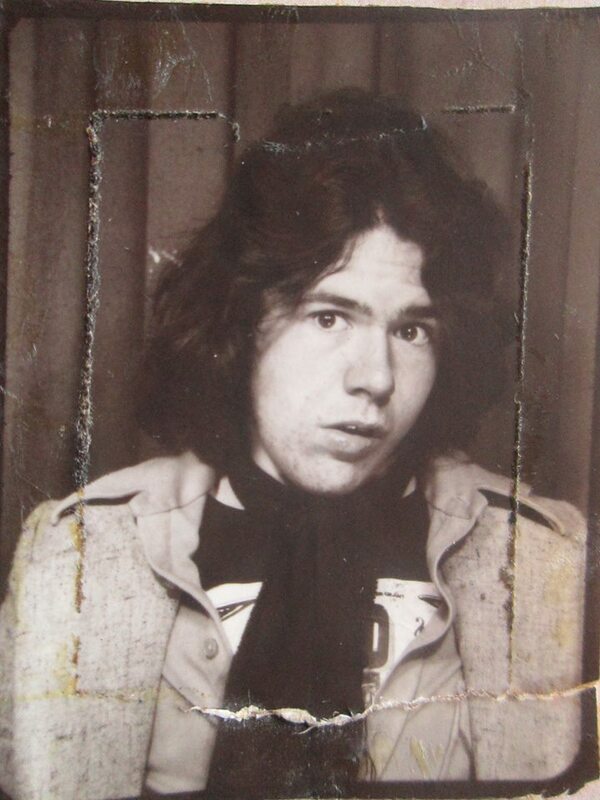 Well firstly I was a big Who fan for sure – and had been since 1969. Pinball Wizard was one of the first singles I’d owned. I’d seen them at the Empire Pool Wembley in October 1975 and at Charlton on a very rainy bank Holiday in May 1976 – on both occasions they were absolutely brilliant. 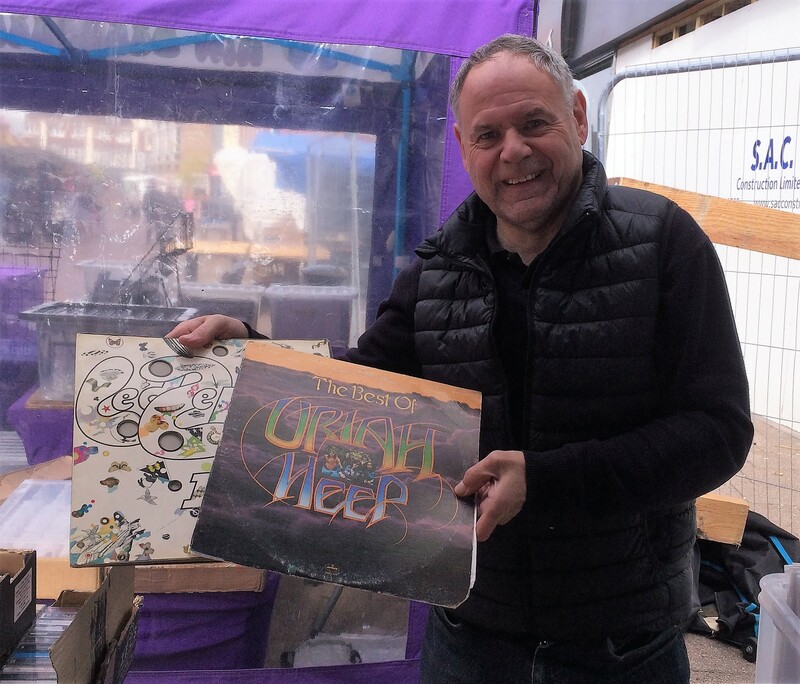 I loved all the albums – particularly Quadrophenia, Who’s Next and The Who By Numbers – albums that spoke to me, were my guiding light and packed power and emotion – next to Led Zeppelin during this era, they were my second favourite band without a doubt. In 1977, The Who began making a film to be titled the Kids Are Alright – a career spanning documentary. For that purpose in December 1977 they decided to perform a low key gig at Kilburn State Theatre in London. My very good friend Dec through the then boyfriend of his sister Yvonne, managed to get in on this gig. 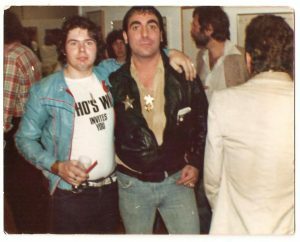 A guy named Steve Margo was the link – he was a massive Who fan – along with another high profile Who fan ‘Irish’ Jack Lyons and one or two others, later staged a Who Exhibition at London’s ICA in August 1978. The Who were unhappy with the footage they got that day and decided to have another go at capturing footage for the film. In early May we heard through Steve Margo that The Who would soon be staging a gig in London to be filmed for the documentary. Plans were all veiled in secrecy – eventually word came though and we were instructed to meet at Hyde Park Corner on the morning of May 25, 1978. 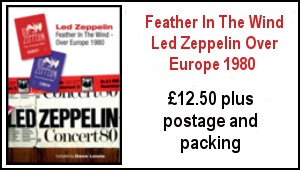 At that time Led Zeppelin were somewhat inactive following the curtailing of their 1977 US tour due to the tragic death of Robert Plant’s son. In May there were reports in the press that they had re grouped at Clearwell Castle for some rehearsing. Later in the year they would travel to Abba’s studio in Stockholm to record The In Through The Out Door album. 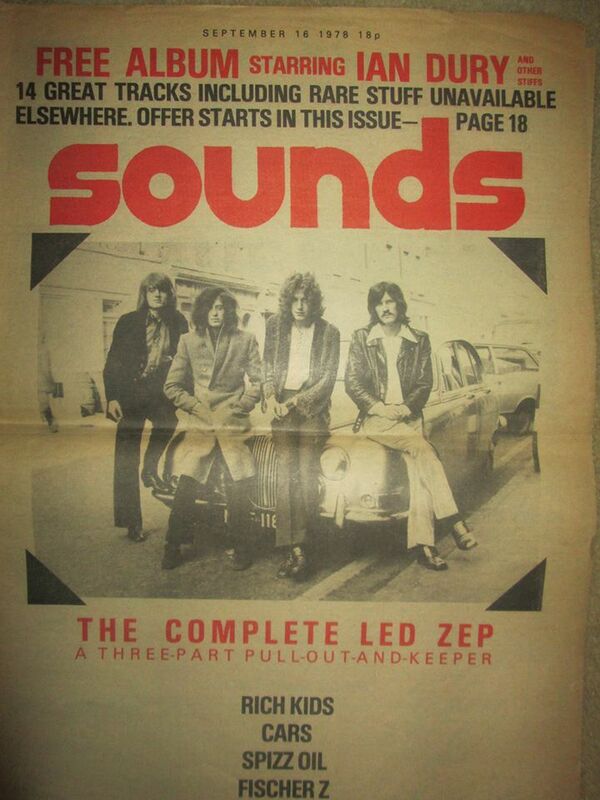 In early May, I was contacted by Sounds writer Geoff Barton. He had seen I had replied to a couple of Zep queries in their Wax Fax column. 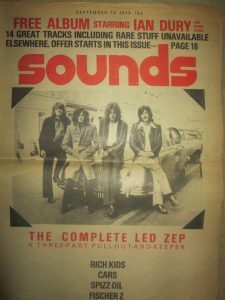 Sounds were planning a special three week feature to run in September to mark the tenth anniversary of Led Zeppelin’s formation. I was commissioned to produce a ten year timeline history alongside an extensive discography covering official releases and bootlegs. I had a fair few meetings at the Sounds office in Long Acre and took in a large collection of memorabilia and albums for them to photograph – no scanning of images back then of course. Subsequently, my summer of 1978 was dominated by this work which had to be in for early August. I hand wrote the entire contents of the feature and by and large when it was all published as a four week part work it was a big success . It was my first time in print and I also got paid for it. More on all this later in the year. I also attended two amazing gig in July of that summer – David Bowie at Earls Court and Bob Dylan at Blackbushe. 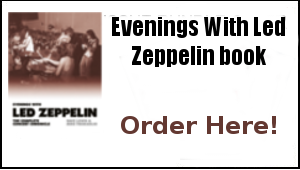 Back to the story – so it was against this backdrop of Zep writing that I turned my attention to this very exciting prospect of witnessing The Who live on stage again. So come the day – Thursday May 25 , we were duly ferried out of London by coaches to the Shepperton studio complex – wined and dined in the canteen where we mixed with 18th century costume drama actors and actress’s and then led into the Studio 2 soundstage for a mini performance by The Who. The filming had been set up by director Jeff Stein to make up for the rather lucklustre footage he had garnered from the aforementioned Kilburn Theatre the previous December. It was to be the contemporary insert of a career spanning documentary that would emerge as The Kids Are Alright released to theatres on both sides of the Atlantic the next year. So it was in a state of some considerable awe that we were ushered into the studio where a specially constructed stage aimed at replicating any night on the road for The Who had been assembled. The audience of around 200 consisted of a mixture of Who fanatics, liggers, journalists and musicians – amongst the latter was a young Chrissie Hynde. Also in attendance shooting one of his first gigs was the soon to become world renowned photographer Ross Halfin. The last time I had seen The Who live was amongst 65,000 rain sodden fans at The Who Put the Boot In show at Charlton Athletic football ground in May 1976. Now I was just a few feet away as Pete Townshend power chorded his way through a riveting Baba O Reily -one of my all time fave numbers not just by The Who, but anyone. Thrilling deliveries of John Entwhistle’s My Wife and Won’t Get Fooled Again followed. The initial plan had been to perform just those three numbers. Impressed by the by the relaxed of nature of the whole affair, Townshend signalled to Daltrey, Moon and Entwhistle to stay on stage – and spontaneously they kicked in to Substitute and then instantly into I Can’t Explain. We had come under the guise of seeing The Who shoot a handful of numbers for their film – we were now privvy to a mini greatest hits concert as they ran through Summertime Blues, Magic Bus My Generation and My Wife (again). It was another blast through Won’t Get Fooled Again that brought this extraordinary performance to a close. Watching it all unfold in such close proximity was truly the stuff of rock’n’roll dreams – it was just utterly sensational. Fulled by a combination of beer and wine, and a surge of adrenalin from the sheer wonder of what I was witnessing, as Won’t Get Fooled Again ended and the band warmly took the applause, I took it upon myself to climb on the camera tracking and make one giant leap towards Pete Townshend and then one small step towards Roger Daltrey accidentally cuffing him in the eye in the process. On any regular gig this spontaneous stage rush may well have resulted in the stinging sensation of a swinging Gibson Les Paul crushing against flesh. I was aware of Abbie Hoffman’s treatment by Pete when he walked on to the Woodstock stage during their performance in 1969 – I really did not have time to think of any consequences as I made that leap. Luckily for me Townshend hugged me warmly and Daltrey good humouredly shrugged off my enthusiastic arm waving. it’s worth noting I was not alone in this stage invasion – though I was not aware of it at the time. In the film just before my entry you can see a young lady more calmly approach and hug Roger. Behind all this action, a permanently devilish grin was spread across the face of Kith Moon. Physically showing the strains of his LA lifestyle he was at last back where he functioned best… on stage with the ‘Orrible ‘Oo. As we waded out into the bright late afternoon sunshine little did we realise we had just witnessed Keith Moon’s final public performance with The Who. And little did I realise that my leap of faith would be subsequently retained in the film’s final cut. Outside in the grounds of Shepperton there was one more task for the lucky few in attendance to perform. We were asked to line up in four rows behind each member of The Who. This was for a potential album cover design for The Who’s forthcoming Who Are You album – the concept being that we would act as clones for the band to illustrate the album title. 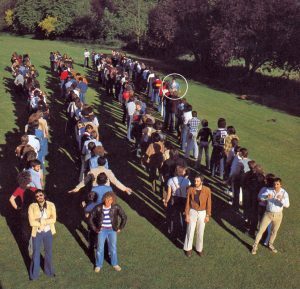 So we were all asked to line up – I was in the queue behind Keith Moon. As it turned out this cover idea was scrapped. However, years later a couple of outtake photos from this session appeared in the Ross Halfin complied Who Genesis Publications photo book. These photos reveals that for some reason, I had stepped out of line and you can see me in my blue bomber jacket to the right – another remant of the day. Incredibly this was not the end of the Shepperton saga. Steve Margo informed us that he had been invited to attend another filming session the next day – and did we want to tag along? Did we ever! So it was on Friday May 26 Dec and I met along with Dec’s sister’s boyfriend Jack we met Steve in St. John’s Wood who then drove us to the Shepperton Studio complex. We were were allowed in to the Studio 2 soundstage again and there before us onstage were The Who. This time in front of a camera crew and a few technicians, road crew and Who personnel including soundman Bob Pridden, lighting expert John Wolff and Who manager Bill Curbishley. I could never have envisaged back then that one day I would interview Bill in his office discussing The Who, Led Zeppelin , Jimmy Page and Robert Plant. Irish jack was also there. The objective of this days filming was to perfect the laser sequence during Keith Moon’s drum solo and into Roger’s scream before Pete and John come back in. We watched multiple takes of Keith performing his solo and Roger bathed in lasers marching on the spot as the camera panned in. We watched this repeated scene in absolute awe. 40 years on this close up experience of The Who filming this sequence remains right up there amongst the most thrilling live music moments I’ve been lucky enough to witness. 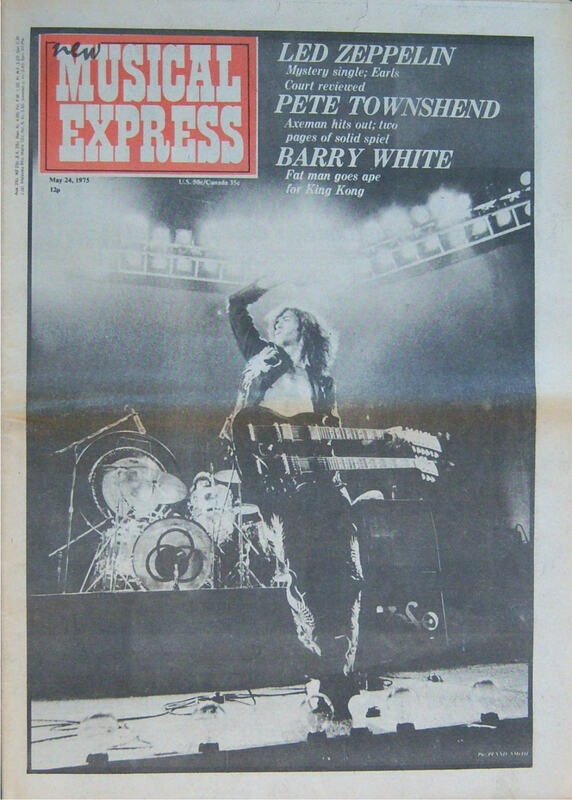 I was back behind the counter at my job in WH Smiths next day – and back on the Led Zep Sounds feature for the next few weeks. I did hastily hand write a couple of thousand words of a review of the May 25 Shepperton experience – I aim to search that out from the loft in the next week or so and get it into shape to put up here. This was not quite the end of The Who 1978 story. On August 1 1978, Dec and I attended the opening of the Who’s Who Exhibition at London’s ICA. Both Pete Townshend and Keith Moon were in attendance. The producer of the film Jeff Stein saw me and informed my I could be clearly seen in the final scenes of the film leaping on stage. The Who’s Who exhibition was superbly well done and way ahead of it’s time with stage clothes, instruments ,videos etc. I had a chat with both Pete and Keith – and had a photo taken with him. He seemed on great form proudly talking about the famous Pictures Of Lily drum kit that was on display. 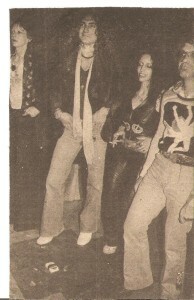 This pic shows me with Keith and Ian Dury with his back to us. The Who Are You album came out in August and I purchased it on the day of release. An excellent album with some superb performances such as New Song, Sister Disco, Love Is Coming Down and the title track. It still sounds brilliant. On the evening of Thursday September 7, I was watching the News at Ten on TV when they announced that Keith Moon had been found dead. It was no secret that Keith had carried a lot of demons around in recent years but it was still a terrible shock. Unlike Zep, The Who decided to carry on – for them I’d say it was the right decision though it was never quite the same. 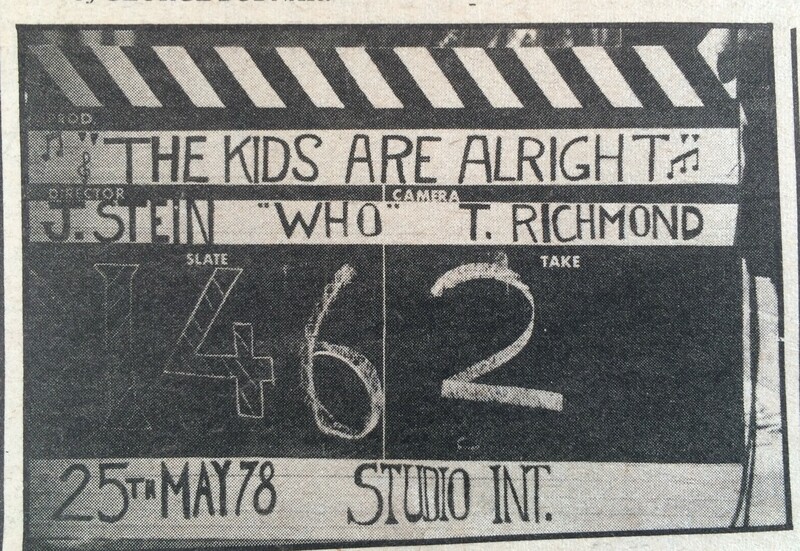 In June 1979 The Kids Are Alright film came to Bedford. Knowing I may appear in it, our gang of Dec, Tom, Phil etc all came along to view it at the Granada Cinema in Bedford (sadly long gone). The film overall was excellent with some fantastic footage – no sighting of me of course until right at the close as the credits rolled… then on I leap into Pete Townshend’s’ arms (and nearly poking Roger Daltrey’s eye in the process!). In the cinema a huge cheer greeted my arrival – and of course I was well pleased I had made the final cut. 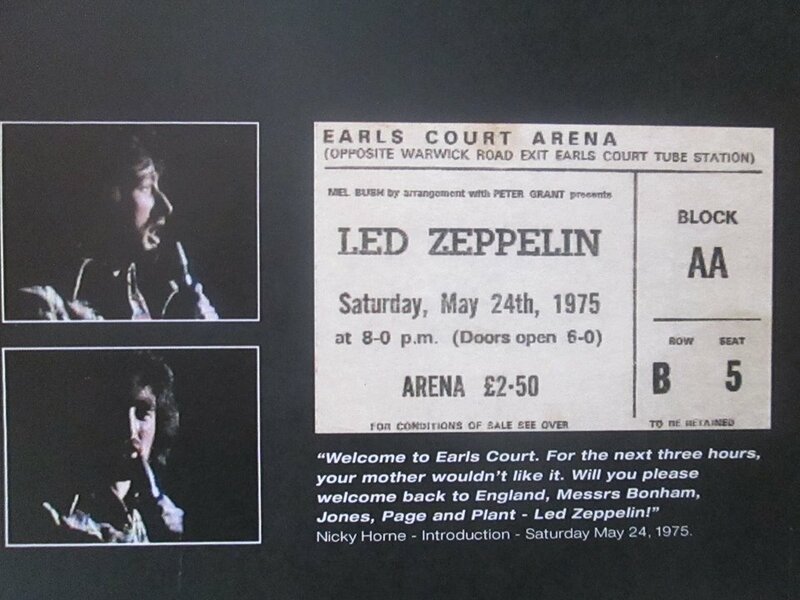 In August 1979 ,a week after the second Zep Knebworth show we went to Wembley Stadium to see The Who on a bill that included AC/DC (with Bon Scott), The Stranglers and Nils Lofgren. The Who were still great with Kenney Jones on drums but it was a somewhat challenging day – with lots of crowd trouble down the front. I’ve seen The Who a fair few times since 1978 – notably at the Watford Town Hall in 2002, at the London Forum 2004, the Quadrophenia presentation at the Royal Albert Hall in 2010 and on March 23 2015 at the 02. 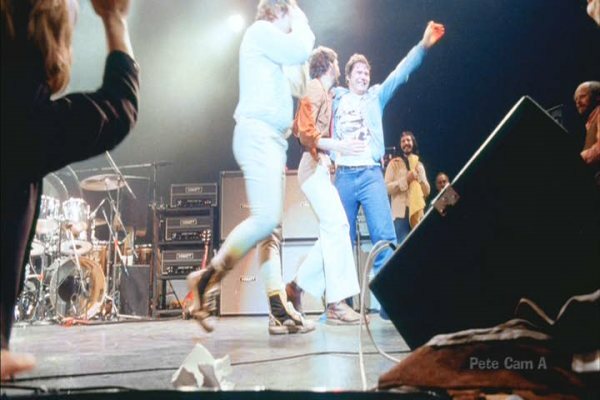 Even though they are now down to The Who Two , their catalogue of era defining music is still a crystal clear definition of what rock is all about – the last occasion I saw them at that 02 Arena was yet further testament to the lasting durability of The Who. As for the Shepperton experience, well I’ve dined out on that clip many times since that leap of faith all of 40 years ago. I’m still in touch with the legendary Who fan Irish Jack who was there on those magic Shepperton afternoons – in fact I was in touch with him this week. Looking back now, It was a moment that crystallised the impact a live performance can have. It was a completely unplanned spontaneous action. 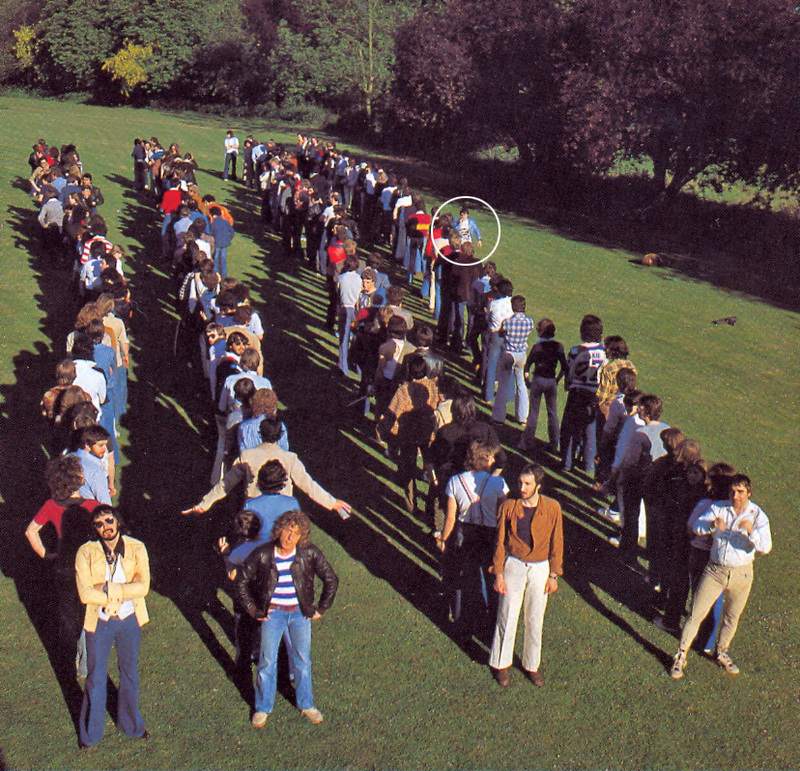 If I had planned it, I would probably have worn a Who T- shirt rather than the McCartney/Wings London Town one I had on! My Facebook friend Michael Starke described this photo (a still from the footage) of me hugging Pete as ”The greatest fan interaction shot ever”. It was some afternoon back in 1978 and 40 years on, the memory of it all looms ever large and pleasingly so…not least because it can be seen from several angles on the YouTube clip. Friday treats at the Vinyl Barn – at the always excellent Vinyl Barn last Friday, I was pleased to find a Best Of Uriah Heep – a US copy on Bronze/Mercury plus I could not leave a copy of Led Zeppelin III in the racks even though it was minus the wheel – therefore it’ a unique copy I’d say – I may even have a spare wheel somewhere! 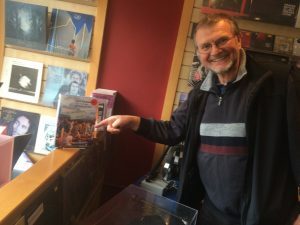 Here’s another pic from my meet with Phil Tattershall – In the excellent Empire Records in St.Albans where Phil is admiring a copy of my Then As It Was Led Zeppelin at Knebworth 1979 book – as he would do as he took the cover photo – nice one Phil! I thoroughly enjoyed the Royal Wedding – one of the highlights of which was the very poignant version of the Ben E King classic Stand By Me by Karen Gibson & the Kingdom Choir. I’ve always liked the spontaneous version performed by Led Zeppelin live in Japan in 1971. Another full on week here -the Evenings With book completion is proving very challenging – and we are not there yet. Co-author Mike Tremaglio has been doing an amazing job overseeing the proof reading. There’s still a lot to and it’s impossible to let go until we get to the finishing line. At the same time, I am trying to keep a hold of everything else going on and it’s not proving easy. I would love to be at the Robert Plant shows this weekend but the book schedule has made that a bridge too far. The pressure of the book schedule and the frustrations surrounding it (and believe me, there are frustrations), along with one or two other things, has caused me to slip into a depressive black dog mood on more than one occasion recently. With the help of some inspiring people close to me, I’ve had to shake myself out of it and move forward in a more positive frame of mind. 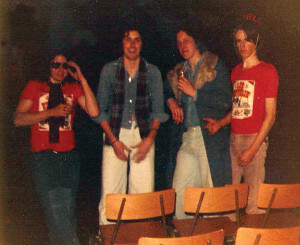 Re Who post Keith – I agree playing on was the right decision for the band. Kenny Jones was a great fit on paper but big shout to Zak Starkey for carrying the weight of this job and others too over the years. We both saw him live with The ‘OO in North London 2004 – simply stunning. 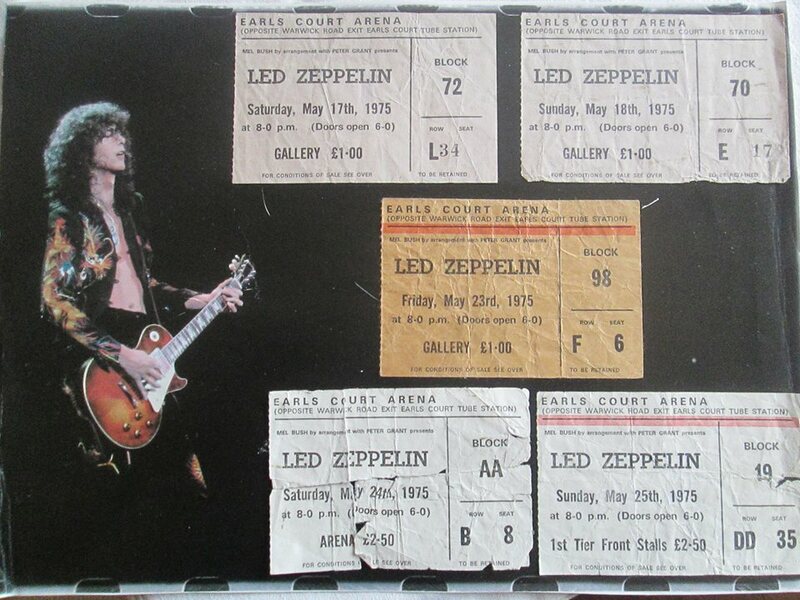 Stand By Me was performed by Led Zeppelin in 1972, not 1971 — Festival Hall, Osaka, Oct. 9th, 1972 to be exact. Just a caress mistake I assume. Coincidentally, they had given a delayed, second encore on Osaka first night the previous week, presumably because of Robert’s fatigued voice. On this occasion the reason was more positive. All my speculation, after all. Enjoyed reading the celebration of FON 25th anniversary. While certain things we might have been enthusiastic about way back in the day don’t always necessarily age well, FON has easily stood the test of time, and to these ears stands as Robert Plant’s finest solo achievement, hands down. The b-sides which emanated from those sessions were also great and could have comprised almost a mini-album on their own. I love all of the acoustic blues material he recorded with Rainer Ptacek. The Who stuff is classic! Pretty cool playlist. Hejira by Joni Mitchell is my favorite album of hers, and Amelia is my favorite song by her.